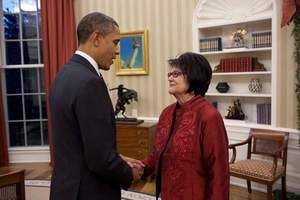 The death of Elouise Cobell, the famed woman who led a 15-year fight for Native Americans' land rights, is being felt all the way from the Blackfeet Reservation to the White House. Cobell, 65, died Sunday evening at Benefis Health System after fighting her latest battle, cancer. Cobell was born on Nov. 5, 1945, and was raised as one of eight children on the Blackfeet Reservation and carried the name "Yellow Bird Woman." A great-granddaughter of Mountain Chief, one of the legendary Indian leaders of the West, she was diagnosed with cancer weeks before her class-action lawsuit was given final approval by a federal district judge in Washington on June 20, according to her publicist Bill McAllister. In 1996, Cobell and four other Native Americans filed a lawsuit against the federal government demanding thatthe government give Native Americans an accounting of billions of dollars it received for oil and gas leases and other uses of individual Indian lands held in trust by the United States. After a long, tenacious fight, the Obama administration agreed to settle the lawsuit in December 2009, creating a $3.4 billion fund to, among other things, make payments to individual Indian money account holders. This was the largest class-action settlement with the government in American history. "Elouise Cobell was a warrior for justice, a voice for the voiceless, and a dear friend," said Sen. Max Baucus, D-Montana. "Our state and our country are better for having known her." Gov. Brian Schweitzer echoed those comments. "Nancy and I are praying for her family and friends during this difficult time," he said. "The Blackfeet Nation and all of Montana have lost a true inspiration and hero." Sen. Jon Tester, D-Montana, called Cobell a "star" and "guiding light" that led the way for all Americans. "Elouise's tireless leadership set this nation on a new course, and what she accomplished reminds us that any person in any part of this country has the power to stand up and right a wrong, no matter how difficult it may be," he said. Congressman Denny Rehberg, R-Montana, also worked with Cobell on several occasions. "As Jan and I join Montanans who grieve the loss of Elouise Cobell, we can't help but remember the incredible things she accomplished with her life," he said. "I will never forget her determination to do the right thing. Her efforts are an inspiration for generations of Montanans to come." News of her death also grabbed the attention of U.S. Secretary of the Interior Ken Salazar. "She sought justice to address historical wrongs that had weighed on our nation's conscience and was a significant force for change," Salazar wrote. 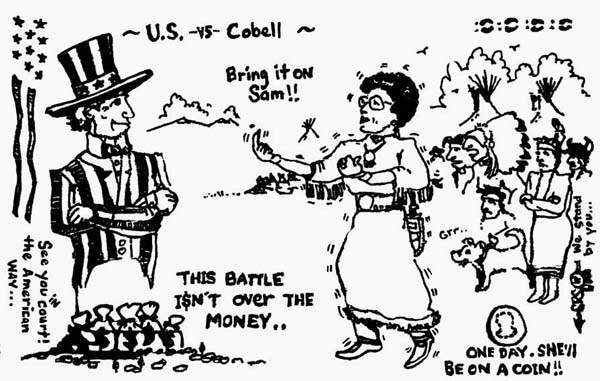 Cobell's legacy extended well beyond her own Blackfeet people. "She will go down in history as a heroine and role model for our young people as long as we, Native People, continue to exist," Fort Peck Tribal Chairman A.T. Stafne said. "The Creator laid out her path. She was given directions, and she followed the path with determination, compassion, humility and dedication.She did great things and now it is her time to rest and let others finish the journey for her."